There are 15 Assisted Living Facilities in the Fargo area, with 6 in Fargo and 9 nearby. The average cost of assisted living in Fargo is $2,633 per month. This is lower than the national median of $3,346. To help you with your search, browse the 9 reviews below for assisted living facilities in Fargo. On average, consumers rate assisted living in Fargo 4.5 out of 5 stars. Better rated regions include West Fargo with an average rating of 5.0 out of 5 stars. Caring.com has helped thousands of families find high-quality senior care. To speak with one of our Family Advisors about assisted living options and costs in Fargo, call (855) 863-8283. The most populated city in North Dakota, Fargo is a college town where North Dakota State University is located. It is also the core city of the Fargo-Moorhead metropolitan area which also includes the towns of Moorhead, West Fargo and Dillworth. Seniors make up 10.9 percent of the population in Fargo and there are 15 assisted living facilities in the Fargo area to support them. They are all licensed by the North Dakota Department of Human Services. The Fargo weather is predictably cold in the winter, with large amounts of snow. Lows remain in the single digits from December through February and stay at freezing until April. Summer temperatures will rise into the mid-80s but are generally pleasant. Even though it is the biggest city in North Dakota, the air quality in Fargo is generally good. The cost of living in Fargo is about even with the national average overall, if not slightly more costly. Most of this is due to higher housing costs. Necessities like groceries and health care are more expensive as well, though utilities and transportation are lower. There is a surprisingly high crime rate in Fargo when the size of the city is taken into account, with its total crime comparison well above the state average and just below the national average. Fargo is only considered safer than 13 percent of American cities. The Fargo metro area’s Valley Senior Services offers a metro senior ride service that consists of a bus holding up to 14 passengers who are 60 years or older. It will take them to go grocery shopping for a very low fee, or to meal sites. The Fargo area is home to world-class medical facilities, including Sanford Medical Center, in the event of medical emergencies or illness. Assisted Living costs in Fargo start around $2,633 per month on average, while the nationwide average cost of assisted living is $4,000 per month, according to the latest figures from Genworth’s Cost of Care Survey. It’s important to note that assisted living rates in Fargo and the surrounding suburbs can vary widely based on factors such as location, the level of care needed, apartment size and the types of amenities offered at each community. 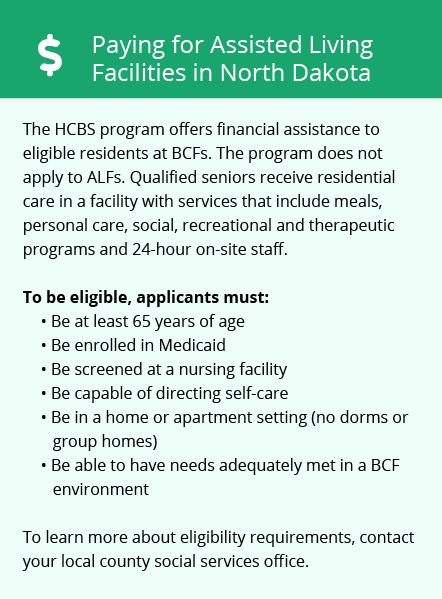 North Dakota offers a state Medicaid program called Personal Care Service which provides assistance to those living in assisted living facilities, among other places a senior might be living in. Eligibility for this program is for those with very little income or net worth and an inability to do one of a number of daily activities, like take a bath, get dressed or use the bathroom on their own. 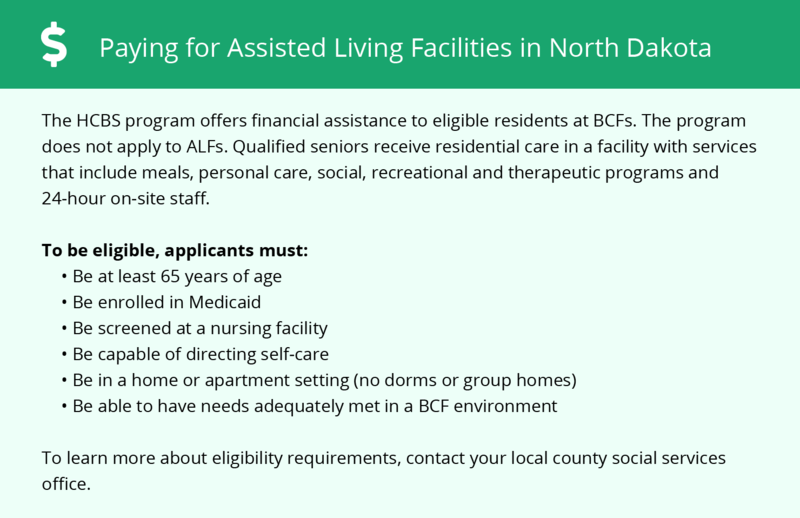 Learn more about these programs, plus who’s eligible, on our Assisted Living in North Dakota page. For more information about different ways to finance assisted living, visit our Assisted Living in North Dakota page. Fargo and the surrounding area are home to numerous government agencies and non-profit organizations offering help for seniors searching for or currently residing in an assisted living community. These organizations can also provide assistance in a number of other eldercare services such as geriatric care management, elder law advice, estate planning, finding home care and health and wellness programs. To see a list of free assisted living resources in Fargo, please visit our Assisted Living in North Dakota page. Fargo-area assisted living communities must adhere to the comprehensive set of state laws and regulations that all assisted living communities in North Dakota are required to follow. Visit our Assisted Living in North Dakota page for more information about these laws.